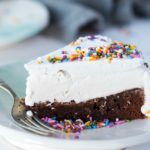 This simple homemade ice cream cake layers brownie, ice cream, and whipped coconut cream. It’s the perfect indulgent treat, and suitable for people who are dairy-free and gluten-free! Blend the almond butter in a large bowl until smooth. Then blend in the honey, eggs, and vanilla. Spread the brownie batter into a greased 9-inch springform pan and bake for 25-35 minutes. You can also use a 9 x 13 glass baking dish. Remove the brownies from the oven. Sprinkle the remaining 1/2 cup chocolate chips evenly over the brownies, and spread with a spatula to create a thin, smooth layer of chocolate. Freeze the brownies in the pan overnight. Let the ice cream cartoons sit out at room temperature for at least 10 minutes. Once the brownies are frozen, take them out of the freezer and spread the ice cream evenly on top of the brownie. Return the pan to the freezer for at least an hour. Remove the two cans of coconut milk from fridge and open upside down. Gently pour out the coconut water that is separated on top. Place the thick coconut cream that remains into a bowl and whip until peaks form (about 2-3 minutes on high if using a mixer.) Add the honey while whipping. Remove the pan from freezer. If you’re using a springform pan, unlock your outer ring slowly, gently encouraging the ice cream to release from the sides of the pan with the spatula. Spread whipped topping evenly on top and around the sides of the cake. If using a glass baking dish, spread the whipped topping evenly on top of the ice cream. Garnish with sprinkles. Return the cake to freezer for 1-2 hours, or until completely frozen. Before serving, let the cake sit out at room temperature for 5-10 minutes.